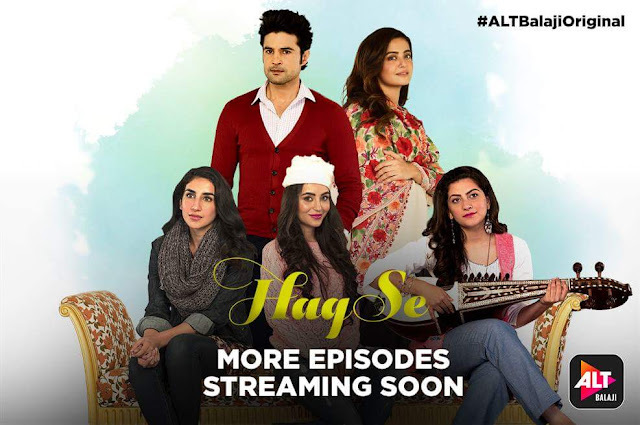 ‘Haq Se’ is an upcoming web series which will be telecast on Ekta Kapoor's Alt Balaji Channel. The web series produced by Ken Ghosh who has made quite a few web shows and is know for films such as ‘Amit Sahni Ki List’ and ‘Phir Se’. ALTBalaji is currently available in 75 + countries and promises to offer 250+ hours of original, exclusive content to its subscribers. It has watch time of more than 100 million minutes so far. The app had over 3 million downloads across iOS and Android users and was recently the No.3 top grossing iTune app in the entertainment section in India. ALTBalaji is planning to offer 32 shows across genres like romance, mystery, drama, thriller and comedy. Recently, the platform launched its first Bengali show ‘Dhimaner Dinkaal’. The OTT platform is planning to launch shows like ‘Maya Thirrai’, ‘Ragini MMS 2.2’, [XXXXX]’, ‘Selfiewali PM’, ‘Judaai’, ‘Punchbeat’, ‘Bose’, ‘Kehne Ko Humsafar Hai’, ‘Broken’, ‘Kapoors’, ‘Four Play’, ‘Girlgiri’, ‘Bandhan’, ‘Home’, ‘Vanity Fair’, ‘Mehrunisa’, ‘Cover Girl’, ‘EK Bhoot’, ‘The Mirza Girls’, ‘Dysfunctional’, ‘Mafia’, ‘Mangalyaan’ and ‘Kali’. It is a captivating story of four sisters named Meher, Jannat, Bano and Amal. The series explores their ambition and how are they bowed down by the rising spectre of fundamentalism in the region.